SINGAPORE - Following a four-day underway period in the South China Sea, littoral combat ship USS Coronado (LCS 4) pulled into Sembawang Wharves for a scheduled maintenance period, beginning Feb. 3. At sea, the crew conducted training exercises designed to maintain operational proficiency while executing emergency procedures at sea. 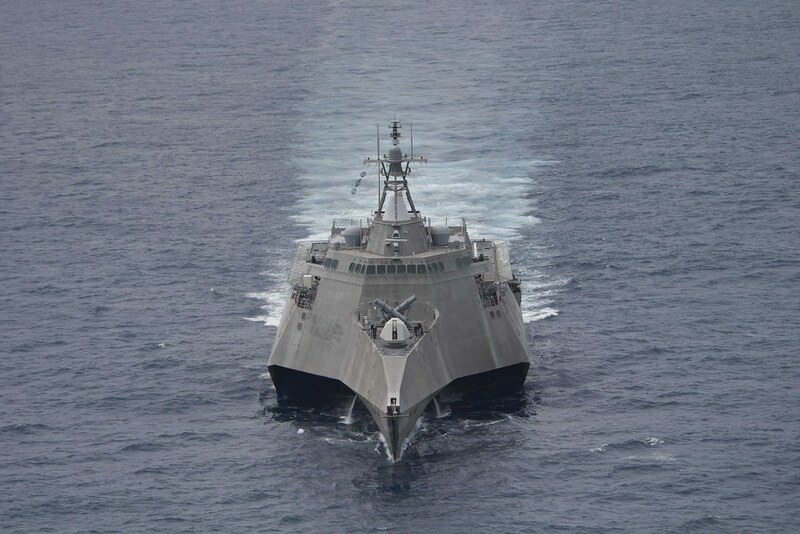 The crew flexed the ship's capabilities with unit-level training, casualty drills, flight operations, and engineering equipment operational testing. "It's been an extremely productive few days at sea and the sense of enthusiasm on the deckplates was evident throughout," said Cmdr. Scott Larson, Coronado commanding officer. "The team completed essential training that will pay significant dividends during future operational tasking." Specific events included small boat operations, live-fire gunnery exercises, damage control drills, and over 20 combined hours of manned and unmanned flight operations. "Warfighting is a perishable skill set, so every opportunity you get to flex those skills is needed," said Command Senior Chief Joseph M. Hanley, Coronado's senior enlisted leader. "This underway was all about that, and the crew worked extremely hard fine-tuning their skills in a multitude of warfare areas. In addition to the training, Helicopter Sea Combat Squadron (HSC) 23 Det. 5 is embarked and conducting turnover with HSC 23 Det. 4, who embarked Coronado June 2016. The underway period served as the at-sea portion of their turnover, and the combined detachments successfully conducted functional check flights and crew training on the MH-60S Sea Hawk helicopter and the MQ-8B Fire Scout unmanned autonomous helicopter. "During our time at sea, the Sailors of HSC 23 made great progress in training and experience as a deployed aviation asset," said Lt. Adam Card, maintenance officer, HSC 23 Det. 5. "We successfully performed maintenance check flights to regain critical flight currency in order for us to be a fully mission-capable detachment." Currently on a rotational deployment to southeast Asia, Coronado is a fast and agile warship tailor-made to patrol the region's littorals and work hull-to-hull with partner navies, providing 7th Fleet with the flexible capabilities it needs now and in the future.